I’ve put up a few posts over the past couple of months about books and games so I should probably explain why. These are probably the most obvious. I read a lot of books, though nowhere near as many as before I started writing. I’ll post reviews for those that I particular enjoyed and which I think will appeal to those who like my books. That means there’ll mostly be Sci Fi and Fantasy but I’ll chuck others in too from time to time. Computer Games (just Games from now on as I’m lazy) need a bit more of an explanation. I’ve been a keen gamer for more than 30 years now, playing everything from Galaxians to the latest graphics intensive mega games. That’s long enough to have seen some interesting patterns – for example one of the first games I played (and loved) was Elite. Now, some thirty years later, I’m enjoying playing the beta of the latest incarnation – Elite Dangerous. So I play a lot of games, but I won’t be posting all or even most of them here. At the core of this blog are stories and the games I’ll blog about are those with a really strong story – either the background for the world or the game buy doxycycline in thailand itself. I know you won’t all be gamers but even so the stories might be interesting enough for you to go take a look and find out a little more. So far all the blogs have been for games on Kickstarter which are looking for funding just because they’ve come up recently. Looking ahead I’ll also be touching on existing games which also have great stories, especially if they tell those stories in an innovative way. Talk about a dumping ground! Other covers anything else that catches my eye, but once again it’s going to either be strongly story based or have a strong Sci Fi / Science / Fantasy link. For example I’m sure I’ll touch on the latest Doctor Who series once everyone’s had a chance to catch up with it (“Spoilers” as the last Doctor so often said). Other things will drift in here too from time to time. 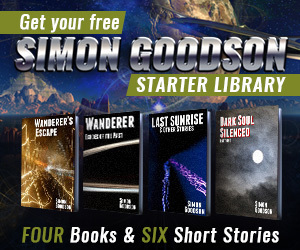 If you like this sort of thing then check out my facebook page (https://www.facebook.com/pages/SimonGoodsonAuthor/104549443042543) – there’s a lot more posted there than I’ll ever get around to blogging about. I hope you all enjoy the relief from updates about my books, progress and general ramblings. Let me know what you think.